Welcome to an all new 2019 edition of Saturday Night Movie Sleepovers! J. Blake and Dion Baia are kicking off the season with a fantasy classic, a movie which has collected a huge cult following over the years. The boys are chatting the George Lucas and Ron Howard epic, Willow, from 1988! Dion and J. Blake reminiscence about this movie gem, discussing their history with it and the other fantasy films of the era that populated the genre. They talk about George Lucas and his influence in creating the story and working hand and hand with Ron Howard, to see this project to fruition, and the giant leap in CGI Effects, courtesy of ILM and SFX legend Dennis Muren; revolutionizing the “morphing” effects which played significant roles in many blockbusters of the late 1980’s and 1990’s. So come on and take a seat, as the fellas kick off a fun, informative and hilarious brand new installment of Saturday Night Movie Sleepovers! 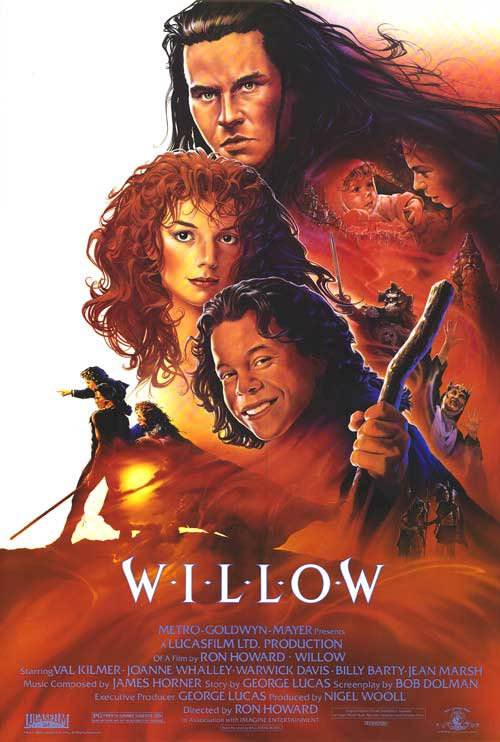 Take a look at this vintage trailer for Willow! Check out this behind the scenes 1988 featurette discussing Willow! Here’s a great 2013 interview with Warwick Davis and Val Kilmer!